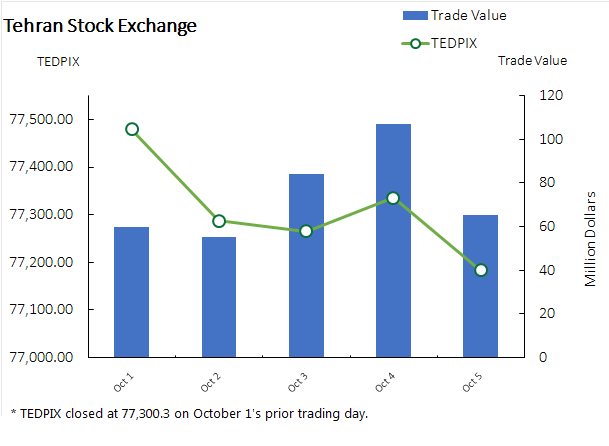 Tehran Stock Exchange’s benchmark index lost 117 points or 0.2% during the trading week that ended October 5 to close at 77,183. TSE trading week begins on Saturday and ends on Wednesday. Over 6.3 billion shares valued at $373.4 million were traded in 445,000 transactions during the week. The number of traded shares and weekly trade value grew by 50% and 25% respectively compared to the previous week. The First Market Index grew by 81 points or 0.02% to end at 53,917 and the Second Market Index dropped by 1,216 points or 0.7% to close at 169,332. The ‘leather goods’ group of TSE-listed industries had the highest weekly rise in share value (11.73%). ‘Agriculture’ (9.72%) and ‘auto manufacturing’ (8.40%) came next. IFX, the over-the-counter Iran Fara Bourse’s main index, shed 5 points or 0.6% during the same week to end at 812. More than 1 billion securities valued at $161.4 million were traded in 222,000 transactions at IFB. The number of traded shares and weekly trade value declined by 1% and 9% respectively compared to the week before. IFB’s market cap lost $45.5 million or 0.2% to reach $27.6 billion. 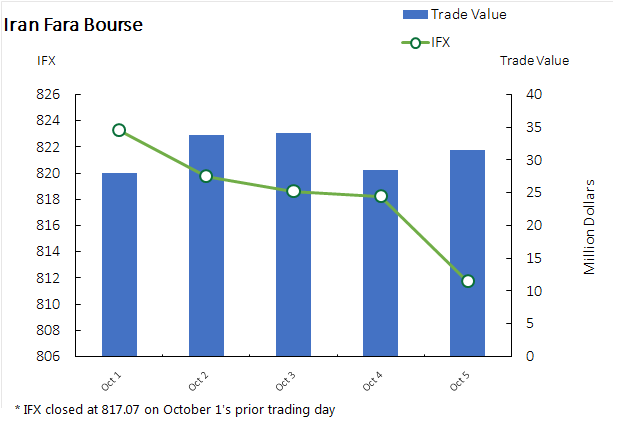 IFB’s First Market witnessed the trading of 172 million securities valued at $11.1 million, indicating a 37% and 40% setback in the number of traded securities and trade value respectively. Some 578 million securities valued at $62.2 million were traded in the Second Market, indicating a 27% and 34% rise respectively. The ‘electricity, gas, steam and hot water’ group of IFB-listed industries had the highest weekly rise in share value (23%). ‘Oil products, coke and nuclear fuel’ (9%) and ‘base metals’ (7%) followed.